The customer always comes first. The customer is always right. You’ve heard these phrases before, but most likely in reference to businesses in the service industry since these businesses depend on high customer satisfaction to succeed. However, according to entrepreneur Steve Blank, every business needs to pay closer attention to its customers. Watching Silicon Valley startups fail due to an unawareness of this basic principle pushed a frustrated Blank to establish the customer development methodology in the 1990s and early 2000s. 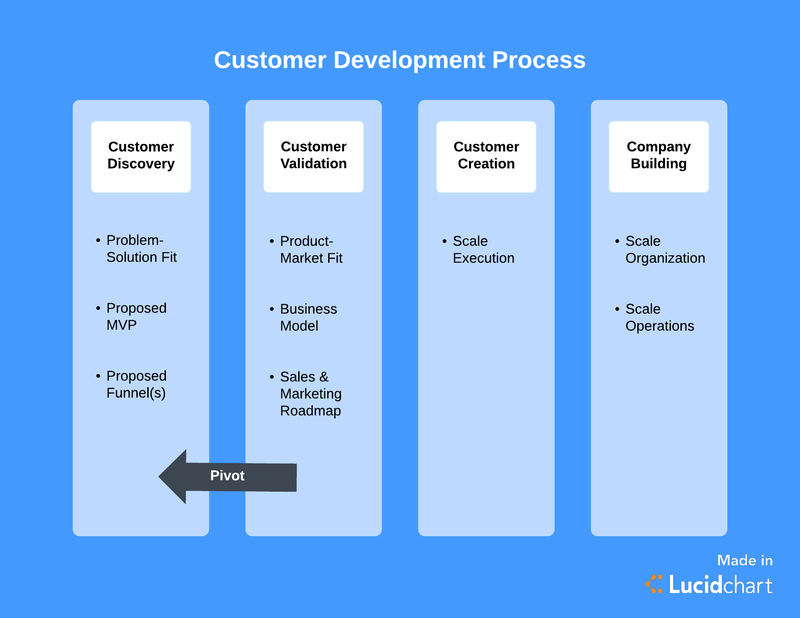 Created with startups in mind, the customer development methodology remains valuable to modern businesses by providing them with a framework for assessing a product’s viability through the lens of customer demand. This methodology has been described as the opposite of a “If we built it, they will come” philosophy—instead, Blank encourages companies to spend more time testing and interacting with potential customers before they even begin to sell a product or service. The following four steps establish direction for your product with the goal of identifying potential customers and finding a better way to meet their needs. Whether you’re struggling to come up with the right idea or have been polishing a well-developed brainchild for years, the customer development process can give you insight into what your potential customers actually want. Every business starts with a hypothesis, but customer development methodology focuses on figuring out how to make your proposed product or service cater best to customer needs. During this phase, you’ll put together a business strategy and then test both your “problem” hypothesis, or your understanding of customer pain points, and your “product” hypothesis, the solution you have developed to solve those pain points. What are your customer’s most significant pain points? Does your product or service solve those pain points? Do potential customers believe that your concept will solve their pain points? You can use Lucidchart to document customer responses and research, make notes, and catalog the information you gather in one easy-to-access place that will remain a resource for you and your team as you move forward. Now that potential customers have verified your concept, you can prepare to sell. During this second phase, you’ll develop a repeatable, scalable sales process as you sell to “earlyvangelists,” or visionary customers who immediately understand the need for your product or service. 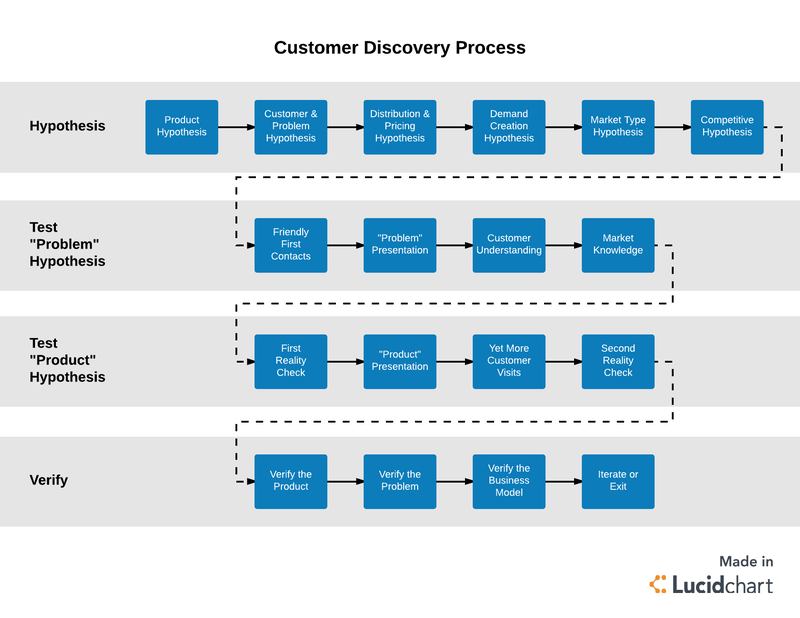 Use the insight you gathered from customer discovery to develop the materials you need, including a business model canvas, value propositions, sales collateral, and product positioning. According to Steve Blank, this is the step of the customer development process that shows you whether your business has a future. That decision is always for the business owners and stakeholders to make—after all, other factors like capital and overhead will also affect your business’s viability. However, failure at this stage doesn’t necessarily mean it’s the end of the line. For startups entering the marketplace with just one product or service, this is the time to turn around if there isn’t enough demonstrable customer interest in what you’re selling. Revisit the first step if needed to make sure you have the necessary buy-in. At this point, you should see quantifiable demand for your product in the marketplace, so shift your focus to increasing that demand. Make your product and business sustainable by figuring out how to scale, or continue to profit and function efficiently with growth. Continue listening to feedback, watching industry trends, and adapting so you can both offer the best product you can and retain the customers you’ve earned. This phase is less about exploration and more about maintaining the momentum you already have. Though the details may diverge, the main point of this phase is to guarantee sustainability for your business through careful growth strategy. As the final phase of the customer development process, customer building “transitions the organization from one designed for learning and discovery to a well-oiled machine engineered for execution.” This phase could include defining roles, creating formal departments, and hiring more people to help your bootstrapped, loyal team accomplish bigger goals. Steve Blank created the customer development methodology with startups and their unique needs in mind, so it’s okay if your company doesn’t reach this step the first time you move through the customer development process. 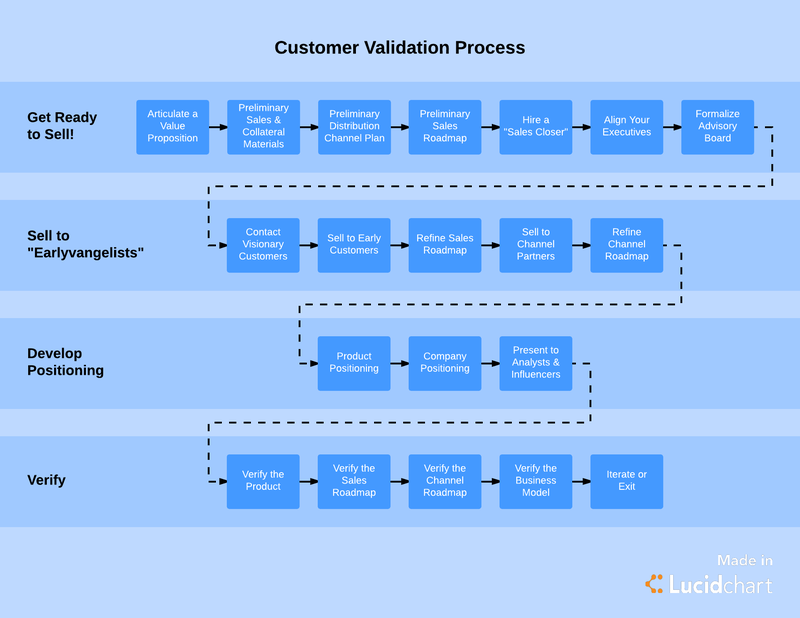 Some companies may need to turn around and redirect focus after customer validation or customer creation, and others take a long time to reach this “final” phase. Use Lucidchart as you create timelines, org charts, onboarding plans, and other documentation that will help you build your company. If you start your business with the customer development methodology in mind, you’ll find the right customers and solutions to make your startup a success. Sign up for Lucidchart to track your progress and adapt along the way.